So, just in case you feel like sitting on the couch and listening to the soulful voice of the evergreen legend that connects to your emotions to the feeling of love, then we have great news for you. The new song “Lagaya Dil” by Sajjad Ali is finally out to make you fall in love with sweet melody and his magical voice. After his melodious journey at Coke Studio in the last season, Sajjad Ali is back with even better music than before. Once he released his new music video on YouTube, Sajjad Ali’s popularity among fans went to a new level. His new song speaks about how young love has a sense of newness and magic in it, and how this love can become unforgettable infatuations. The music video too, seems to be following the lyrical narrative as the singer. In the music video, the singer not only shows us the different kinds of love that exist but also that some may carry heartbreaks. The music bonds with Sajjad Ali’s soft voice and video to result into a sweet nostalgic memory that many people can relate to. 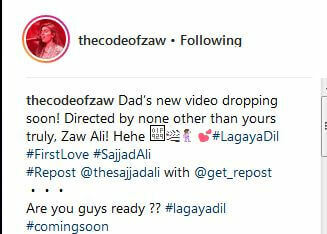 His daughter, Zaw Ali revealed on her Instagram account that she’s the one who has directed the video of her dad’s highly anticipated song. And she is as hyped as we are! One of them said the song made him want to find love! While the other complimented the artist’s work and the music video. We agree! What do you think of Sajjad Ali and Saw Ali’s collaborative work? Let us know in the comments section below. Next Posts We Attended the Ultimate Comic Con 2018 and it Was the Best Comic Convention Ever!